World Wetlands Day 2019 – The Society for the Conservation of Philippine Wetlands, Inc.
World Wetlands Day is celebrated every February 2 of each year. It commemorates the adoption of the Convention on Wetlands in the Iranian city of Ramsar in 1971. It is also declared by the Philippine government in 1999 as National Wetlands Day by virtue of Presidential Proclamation No. 74. For this year, the celebration will focus on the importance of wetlands with the theme, “Wetlands and Climate Change.” The frequency of disasters worldwide has more than doubled in just 35 years, and 90% of these disasters are water-related. Wetlands play a significant role in stabilizing GHG emissions and blunting the impacts of climate change. 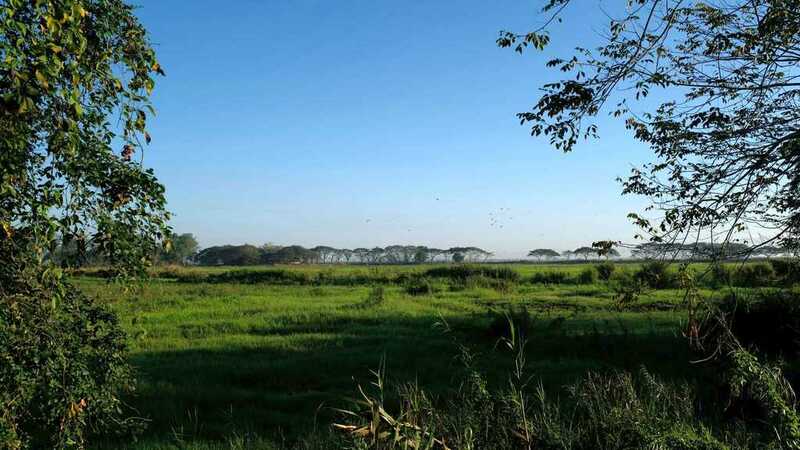 This year, the WWD will be celebrated at the Candaba Wetlands, a complex of freshwater ponds, swamps and marshes with surrounding areas of seasonally flooded grassland and arable land on a vast alluvial plain. The Candaba Wetlands is an extremely important staging and wintering area for migratory birds, from October up to April of every year, as it regularly supports between 5,000 and 10,000 birds. It is a significant part of the East Asia-Australasian Migratory Flyway. 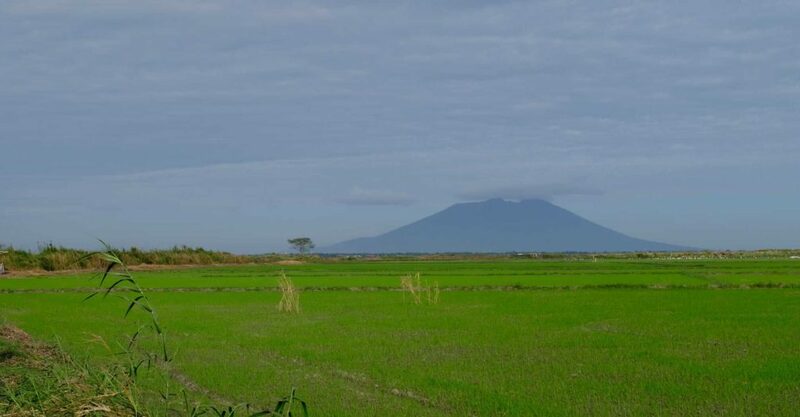 It also forms a critical part of the Pampanga River Basin for a floodwater management strategy for disaster mitigation, conservation and water supply needs. 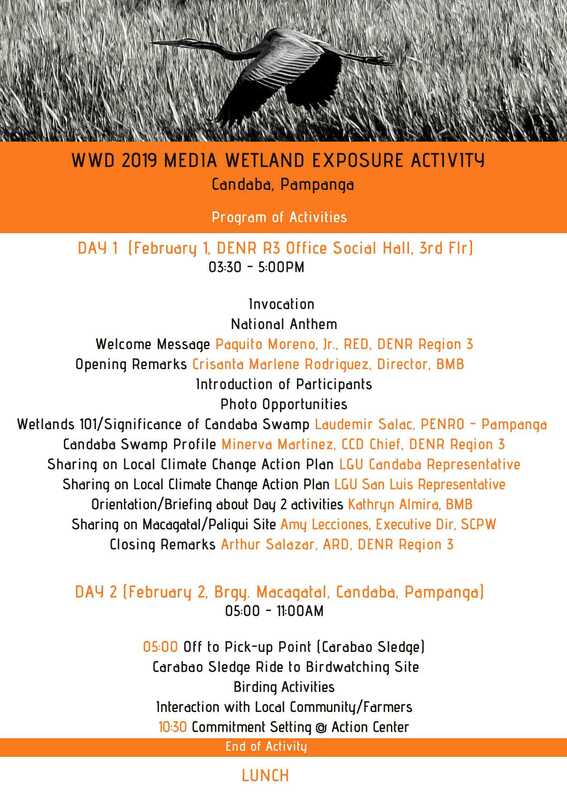 The DENR – Biodiversity Management Bureau (BMB) along with the Society for the Conservation of Philippine Wetlands (SCPW) and DENR Region 3 will spearhead the conduct of a two-day Media Wetland Exposure Activity on February 1-2, 2019 for members of various media organizations and select bloggers at the Candaba Wetlands, located in Barangay Paligui, Candaba, Pampanga. There will be a briefing on the Candaba Wetlands, birding activities, and interaction with the local community. The Candaba Wetlands is an extremely important staging and wintering area for migratory birds, from October up to April of every year when it regularly supports between 5,000 and 10,000 birds. It is also a significant part of the East Asia- Australasian Migratory Flyway. Some of the birds sighted/ resident: Philippine duck, Spot-billed pelican, Egrets, Whiskered terns, Black-winged stilts. Great Cormorant Long-tailed dowitcher, Marsh sandpiper, etc. The two-day activity aims to raise awareness on wetlands and its ecosystem services, particularly its role in adapting to and mitigating the impacts of climate change. By tapping one of today’s most valuable forces: media, this event is expected to generate media coverage reports on wetlands wise use, including write-ups, articles and social media content, among others, from the participating environmental media and bloggers. Inland wetlands such as flood plains, rivers, lakes, and swamps/marshes function like sponges, absorbing and storing excess rainfall and reducing flood surges. During dry seasons in arid climates, wetlands release stored water, delaying the onset of droughts and minimizing water shortages. Peatlands, mangroves, and seagrass beds store vast amounts of carbon. Peatlands cover about 3% of the planet’s land area and store approximately 30% of all land-based carbon — twice the amount than all the world’s forests combined. 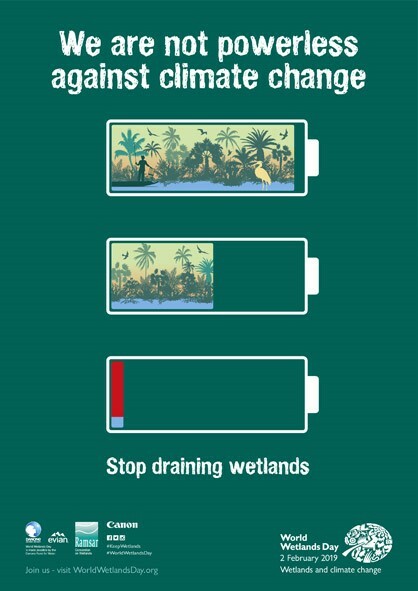 Wetlands are the most effective carbon sinks on Earth. Strategies that address climate change must include the wise use of wetlands. We’ve already lost 35% since 1970. Individuals, communities, and governments must work together to protect these amazing ecosystems, which help us prepare for, cope with, and bounce back from the impacts of climate change. To find out about World Wetlands Day Celebrations in the Philippines visit the SCPW World Wetlands Day Page. You may also visit DENR BMB page on World Wetlands Day 2019. For a history of World Wetlands Day Celebrations around the world visit the Ramsar Website. To learn more about World Wetlands Day visit the Official World Wetlands Day International Website.